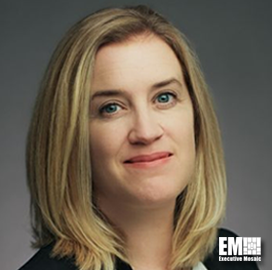 Lucy Ryan, formerly vice president of enterprise communications at Northrop Grumman (NYSE: NOC), has been promoted to corporate VP of communications in a move that takes effect Jan. 1. She will be responsible for implementing Northrop’s worldwide communications strategy in her new position and will also join its Corporate Policy Council, the company said Thursday. “Her experience in communications and corporate affairs will serve her well as the leader of our global communications organization,” said Northrop President and CEO Kathy Warden. “We look forward to Lucy’s contributions to our company’s future growth and performance,” Warden added. Ryan joined the company in September after she previously worked at General Dynamics (NYSE: GD) and at multiple Washington D.C.-based communications and advertising agencies.